Do you know "flea couple" means a little man with a big wife in Japan? That's great Con! Looks like you had a fun time and so generous to sell your clothes so cheap, ne? Now, I got "flea couple"! This is a Japanese proverb "Nomi no fufu". Usually, the female flea body is larger than the males. Thus, couple in which the wife is bigger than the husband is called "flea couple". Of course we are NOT! 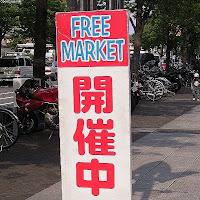 I have ever think "free market"
Conrad&many people is flea too? I have never been to Flea market. 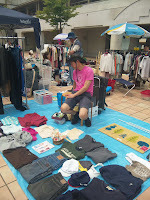 I wanna go to flea market which read this blog. and I wanna go to CA.